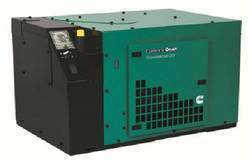 This Cummins Onan 5.0HDKBB is one of the quietest in its class, boasting an impressive 15dB quieter than conventional diesel generator sets. Built with an enclosed muffler for added quietness and easy installation. This set features a side service door through an easy latch, for simple service and maintenance.